What Does it Take to Nail Down a Headliner for a Commencement Ceremony? Finding a header for a college commencement ceremony requires tons of thought — and sometimes cash. 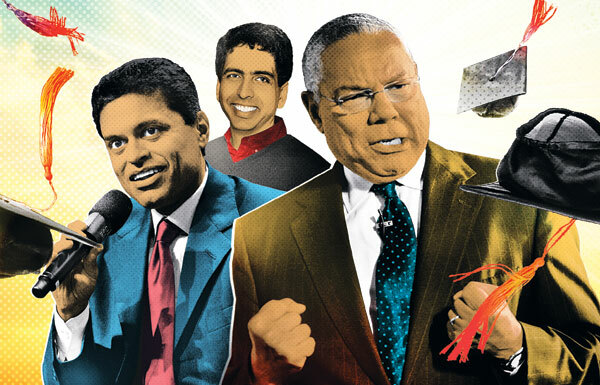 By Casey Lyons·	 5/4/2012, 10:00 a.m.
From left, Fareed Zakaria, Salman Khan, and Colin Powell. The caps and gowns have been fitted, and the bands have “Pomp and Circumstance” down pat. But before thousands of soon-to-be graduates pack up their U-Hauls and leave town, there’s one last thing they need: inspirational words from someone they can look up to. When it comes to booking a big-name commencement speaker, the competition among schools can be fierce — and each institution has its own recruiting strategy. Some go straight democracy (MIT’s one-person, one-vote committee); others leave it up to the trustees (Northeastern). Some pony up — fees for top-tier speakers can reportedly hit six figures — while others rely on connections. At Northeastern, for instance, president Joseph Aoun says Colin Powell isn’t being paid for the address he’ll deliver on May 4. Across the river, MIT has booked investment banker turned online-education pioneer Salman Khan, an alumnus, for its June 8 exercises. Whatever advice Zakaria dishes out, we hope the kids listen (especially if he reminds them not to take their moving vans onto Storrow Drive).